IQ To Release First Ever Blu-ray! British prog rockers IQ will release their first ever Blu-ray, Scrape Across The Sky, on 21 January. Filmed in 5.1 surround sound and stereo at Holland’s The Boerderij venue in December 2014, the live document captures the band on their Road Of Bones tour, and features every track from the first disc of that album, as well as a host of other live IQ favourites. Scrape Across The Sky also features over three hours of extra features, including encores of Ten Million Demons and Widow’s Peak, all the live projections the band use accompanied by the live audio, Until The End recorded at Lorelei’s Night Of The Prog festival in 2014, a photo gallery, and vocalist Peter Nicholls in conversation with the band’s graphic artist Tony Lythgoe. The Blu-ray has been produced by Michael Holmes and engineered by Rob Aubrey. IQ will perform their now legendary Christmas shows to celebrate the band’s 35th Anniversary in December. 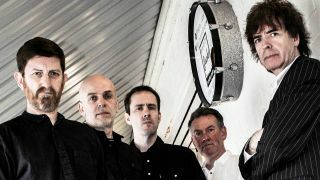 They play The Boerderij on Friday 16 December and the O2 Academy in Islington on Saturday 17 December.